The Community Bookmobile holds over 3,000 popular items for children, teens and adults including books, DVDs, music CDs, video games, graphic novels and much, much more. Each week the Community Bookmobile visits 24 different locations in the community to serve the public.The bookmobile was funded through the generosity of The Friends of the Library. Collection - The bookmobile carries over 3,000 items for children, teens and adults. You are able to find popular materials in a variety of formats including books, music CDs, DVDs and books on CD. Whether you're looking for a board book for the youngest member of your family or something in large print for the mature reader, the bookmobile has most everything you can find at the main library. Computers - Two staff computers allow access to the library's circulation system for the checking in and out of materials. The staff is also able to search the Rochester Hills Public Library's catalog of materials and Research Databases. The vehicle has the capability of adding additional patron computer stations in the future. Purchase - The Library Board approved the purchase of the bookmobile on September 15, 2003 with the Friends of the Library generously providing the funds. The library took delivery of the vehicle in October of 2004. 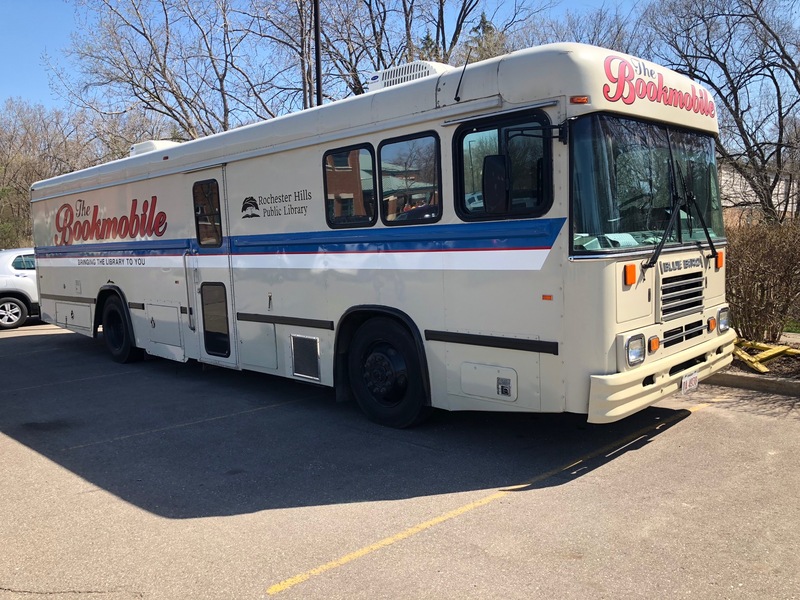 Schedule - The bookmobile provides library service to people in Rochester, Rochester Hills, and Oakland Township who are underserved due to physical, economic, social, geographic or other barriers. The length of each bookmobile stop is one hour with adequate time for driving between stops built into the weekly schedule. For more information on the bookmobile schedule you can call 248-650-7150. Services - Bookmobile patrons receive the same friendly service they have come to expect at the Main Library including the ability to ask reference questions, request materials and apply for and receive a library card. Staffing The bookmobile operates with two staff persons on the vehicle at all times. Daily staffing includes a bookmobile driver/clerk and a bookmobile librarian. All drivers must earn their Michigan Chauffeur's license and pass a Department of Transportation medical exam. Driving records are verified for insurance purposes. Bookmobile and Big Blue Bus stops may be canceled without prior notice in the event of severe weather or mechanical difficulties. Please contact Outreach Services at (248) 650-7150 for questions regarding service. Sign up to stay in the loop with the latest Bookmobile news. Please fill out an application for service if you would like your location considered for our service schedule.